The 18th volume in the Lasallian Studies Collection is now available. 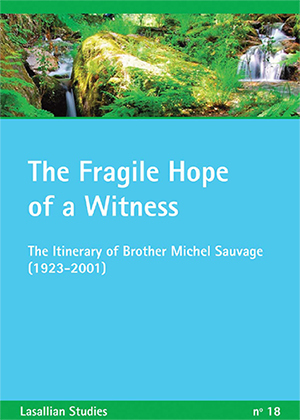 Entitled “The Fragile Hope of a Witness: The Itinerary of Brother Michel Sauvage (1923-2001),” this book was presented to each of the capitulants at the 45th General Chapter by Brother Álvaro Rodríguez Echeverría, FSC, former Superior General. It is customary at each General Chapter for the capitulants to receive a token from the Brother Superior General that will serve as a reference for reflection on the Institute. The result of dialogue between Brothers Michel Sauvage and Miguel Campos, the content of this publication was structured through a series of interviews from these Brothers. The narrative emphasizes the dynamic of hope and helps readers discover significant events of the Institute in the 20th century. The Institute recommends this book be used in formation processes, especially in encouragement of the Institute as a whole and throughout the entire Lasallian family as a review of our common journey based on hope.